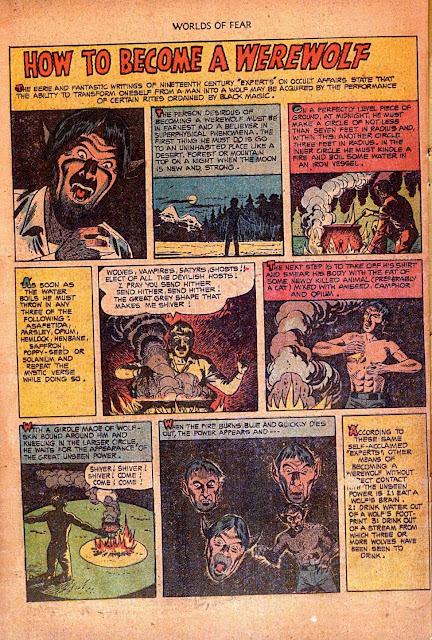 Lately, I've really been enjoying some of the werewolf stories found in public domain comics on the great resource of Comic Book Plus...especially those from the horror books of the pre-Barry Allen 1950s. I'd like to get into the habit of sharing some of those here. To start off, here's a little one-pager from Worlds of Fear #10 (June 1953) with some very practical advice for those hoping to die from the piercing of a silver bullet.